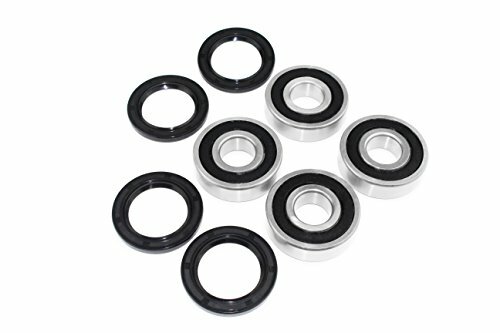 .This kit contains high quality aftermarket Bearings & Seals to repair 2 sides of the Front wheels for the ATV models that shown below: .YAMAHA YFM 350 X WARRIOR ATV Bearings & Seals kit for both sides of the Front Wheels 1987-1988-1989-1990-1991-1992-1993-1994-1995-1996-1997-1998-1999-2000-2001-2002-2003-2004. .Kit contains: Bearing 2. Bearing 2. Seal 2. Seal 2. Fits: YAMAHA YFM 350 X WARRIOR ATV Bearings & Seals kit both sides Front Wheels 87-04. .This kit contains high quality aftermarket Bearings & Seals to repair 2 sides of the Front wheels. If you have any questions about this product by KOB, contact us by completing and submitting the form below. If you are looking for a specif part number, please include it with your message.